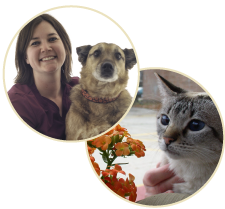 Jess has been a Certified Veterinary Technician since 2010. She began her technician career right here at Whole Pet! She was promoted to a new position in 2017 and now serves as our CVT Manager. She has a Bachelor's degree in Business Management and an Associate of Applied Science degree in Veterinary Technology. She lives on five acres in the country outside of Stoughton with her wife Wendy, their son Silas, two dogs (Bella and Odie), and two cats (Maya and Frankie). In her free time she loves doing anything outdoors! Hiking, camping, kayaking and biking are among her favorite activities especially when the dogs can be involved! She is very interested in animal nutrition and behavior. She really enjoys making a positive difference in the lives of animals and their caregivers.